At 7 years old, Game On Dude is an old man in the racing industry. But the gelding was “smoking” according to trainer Bob Baffert, as he bagged his third Santa Anita Handicap, leading wire to wire. With this win, the Dude made history — he’s the only horse to win three Santa Anita Handicaps AND he broke the previous track record, set by Affirmed in 1979 with a finish time of 1:58:17. The Dude was challenged during the race by Mucho Macho Man and Will Take Charge, but his acceleration coming into the home stretch showed that this “old time” still has a lot of gas in the tank. Nice to see Mike Smith letting the Dude breeze around in cruise control for most of the race. This is a horse who definitely knows his job and likes to run. With this win, Game On Dude brought his lifetime earnings up to $6,163,893. 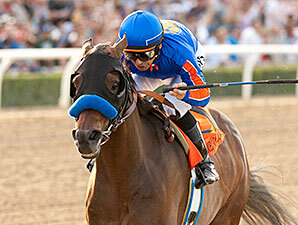 He previously won the Santa Anita Handicap in 2011 and 2013 and has one eight Grade 1 stakes races over his career.